From my personal experience, darlings, our lives are lived forward but understood backward. I know you cannot grasp the magnitude of what I just wrote, because until the past few months, I couldn’t have understood it either. You see, darlings, by good fortune I’ve found the missing link … it is all in understanding how you perceive your history. This takes much time and a new way of thinking. 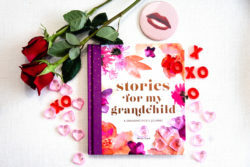 Because we are women over 50, our memories are a book of stories in our head. I have a new method for “reading” them. Journaling is the secret of why I don’t get upset anymore. Journaling makes me incredibly self-aware. Writing is therapy. When you write you focus on detail. I have little doubt that when you think about your past it comes into your mind in bits and pieces. An incident today evokes a memory of yesteryear. Your thoughts stir up emotions, but as quickly as they come in, they go out just as fast because what you’re doing right now takes precedence over the past. Therein lies half of the problem. You take little time to understand how your past and present become embedded with one another to create the “you” in you. I found the missing link because I have been writing down my stories. For five years I have gone back in time writing down my thoughts, which has naturally forced me to revisit and think hard about my past. By going through the stages of my life I found a secret that applies to all of us. This writing has taken a huge amount of my time, but it has brought me to positive conclusions I would otherwise never reached. The other half of the equation is the perception of how we “think” about our past. After hours of delving into my past I have come to realize that every single memory I have stored in my head, even the very worst, is positive. I would never have understood this if I had not lived backward. I will give you an example. When I was growing up in Kankakee by the Sea, I felt set apart from my classmates. As an adult I had no great love for my growing up years until I had written several stories about my experiences. As a child, I hadn’t liked that set apart feeling so I tried harder. I wanted to feel my worth. I did not realize at the time I was developing a great emotional asset, resilience. I didn’t appreciate what I learned in Kankakee by the Sea until l had written about my experiences several times. And, I remember the day I looked up from my computer and stared out in space and it all registered and I said, out loud, “I love you Kankakee by the Sea!” I would like you to look backward and think about your past and take a few experiences that you still see in a bad light and look for the positivity you can take away from them. Like my experience you probably have seen them in a negative light, hidden away in your head, all these years. But were they really negative? I had an epiphany, a sudden insight into how one should see one’s past. It struck a profound cord in me like a full-blown Rachmaninoff Symphony! From that day forward, I knew I would always be visible, most importantly to myself. Every experience we have lived through, every frightening fear, every disappointment, every failure, every embarrassment, every rejection, every unkind person who crossed our path, every lesson learned the hard way, should be looked at as a positive, a strength. Going back to Kankakee by the Sea and my school years, I did not like it when kids were unkind to me. Without knowing this as a child, I was developing the ability to understand and share the feelings of others. It is called empathy. As an adult, I value my empathy for others. It gives me pleasure to help out, to listen and just be there. I feel happy. Those of us who have had to weather storms in our lives might be better off for it especially if we turn back the clock and ask ourselves: “What can I take away from a negative experience in my life? Was it a character builder? Did I lean gratitude? Did I learn resilience? Did I learn compassion or hope or self-confidence? I know we can be happier if we really see our past in a positive light or we can be helpless and feel we have lost control of what happens to us. We have choices, darlings. I am writing from my experiences. Nothing more. I can only tell you how I feel after thinking hard about my past uncomfortable experiences. I realize that difficult times do have positive outcomes. It takes your power to shift your perspectives. This will inject more optimism into your life and optimism will improve your well -being and quality of lifestyle.. So, take some time out of your day, darlings, to live forward, but understand, backward. It works, I swear!! When my husband of 30 yrs. left suddenly, my best friend suggested I write my feelings down. I so wish I had! It would’ve been interesting to read now, 12 yrs. later, to see how far I’ve come. Also, it would’ve helped me to sort out all those feelings I was experiencing. Writing has become a lost art. I so enjoy reading all your posts! Thanks!